This page includes activities and events around the country. Please join us at the 60th Anniversary of the Korean War Armistice and Dedication Ceremony of the Korean War Memorial on Saturday, July 27, 2013 at 11:00AM at the Veterans Memorial Park and Rear Admiral LeRoy Collins, Jr., Veterans Museum. The Park is located at 3602 US Highway 301 N, Tampa, FL, just south of the Florida State Fairgrounds. The Master of Ceremonies will be Ralph Hawkins, President of the Korean War Veterans Association. The National Colors will be presented by the Joint Services Color Guard from USCENTCOM, MacDill AFB. National Anthems of the Unites States of America and Republic of Korea (South Korea) will be sung by the Tampa Bay Korean Woman’s Chorus with Invocation by Capt Young Chang Ha, Chaplain Corps, USN, Retired. The Korean War Memorial Committee Chair, Eddie Ko will review the memorial installation. Keynote Speaker, Mr. Ken Hagan, Chair Hillsborough County Commission who will present a signed Proclamation from the Board of County Commissioners. 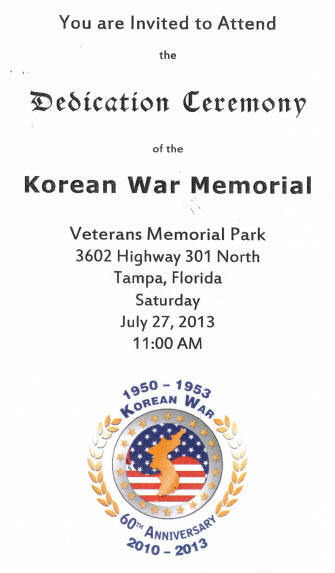 A musical presentation sung by the Tampa Bay Korean Woman’s Chorus followed by the POW/MIA Empty Chair Ceremony and Memorial Wreath Tribute will take place,. The Marine Corps League, Detachment 1226, Riverview will conduct a rifle salute and TAPS. Adjacent to the Korean War Memorial is the recently relocated 1stLT Baldomero Lopez, USMC, Medal of Honor Memorial. He received the Medal of Honor Posthumously during the Inchon Invasion of the Korean War in 1950.
Who: For those that know what true sacrifice is. even allowing those deserving the dignity and respect earned. across the United States to hold ceremonies and remember our honored wounded." What: Stuff you been looking for... Cheap! Tools, Water Heaters, Toys, Computer Printers, ... More than we can fill in here.